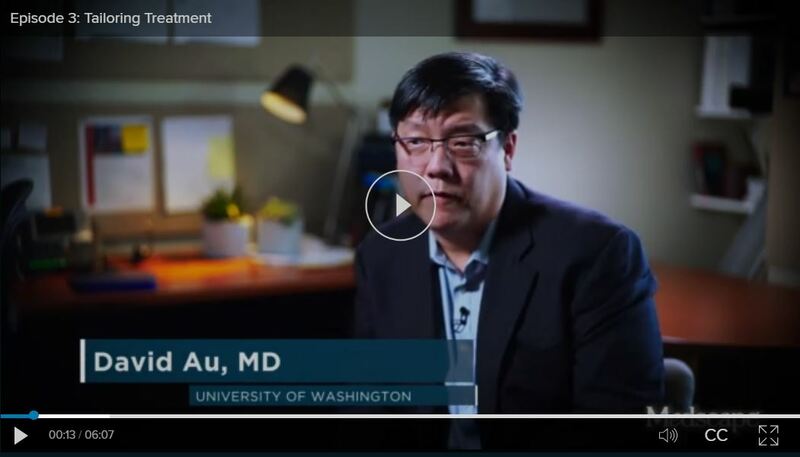 In this video about tailoring therapies to improve the lives of COPD patients, David Au, M.D. talks about improvements in the treatment of COPD, due in part to the number of therapies that are available and also due in no small measure to the patient engagement that some of these therapies involve. Laura Feemster, M.D. adds that medical providers are learning to focus on the patients’ symptoms and exacerbation frequency rather than simply the severity of airflow obstruction. Says Dr. Au, patient-centered outcomes are the focus now, i.e. how the patients feel they’re breathing, how well they can tolerate exercise, whether they’re sleeping well, and other indicators of quality of life. “The 2017 gold update was actually a big step forward, in my opinion,” says Dr. Au. “We moved aside spirometry to grade the severity of COPD.” Now, the “A, B, C, D” tool is used to divide COPD patients into four categories of symptoms, and this tool is useful to determine when a patient should be referred to a pulmonologist. With this categorization system, early treatment, including pulmonary rehabilitation, can be started. The earlier the treatment, the better the outcome.